Astronomers based at Jodrell Bank Observatory, using data from the Isaac Newton Telescope Photometric Hydrogen-alpha Survey of the Northern Galactic Plane ( IPHAS ), have found evidence that giant whirlpools form in the wake of stars as they move through clouds in interstellar space. They compared the predictions from a simulation in three-dimensions of the movement of a dying star through surrounding interstellar gas with observations of the planetary nebula Sharpless 2-188 taken as part of the IPHAS survey. A combined image showing the bright regions and the faint regions behind the bright arc of the Sharpless 2-188 nebula (image credit: N Wright, University College London) [ JPEG | BMP ]. The central star of Sharpless 2-188 is 850 light years away and it is travelling at 125 kilometres per second across the sky. Observations show a strong brightening in the direction in which the star is moving and faint material stretching away in the opposite direction. 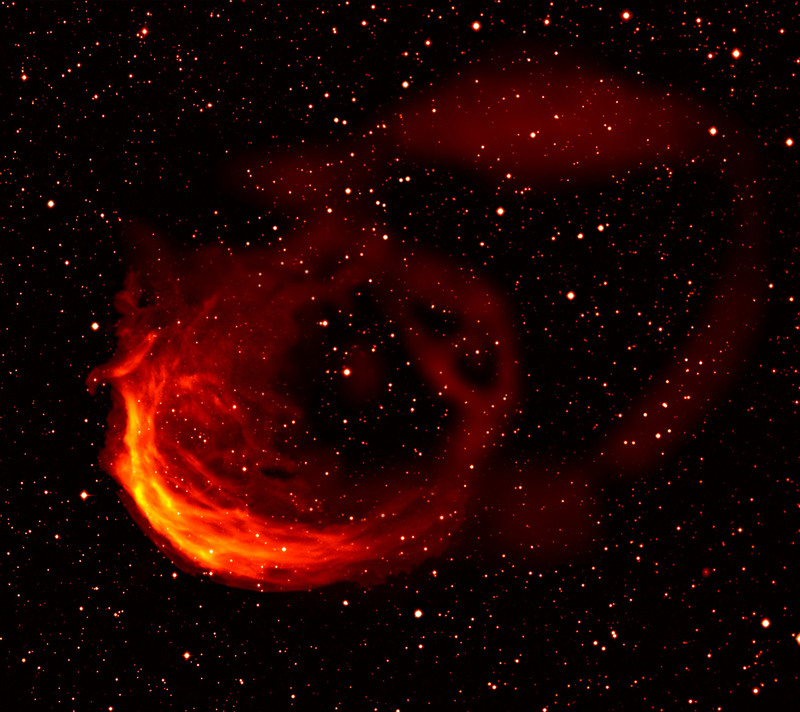 The astronomers believe that the bright structures in the arc observed ahead of Sharpless 2-188 are the bowshock instabilities revealed in the simulations, which will form whirlpools as they spiral past the star downstream to the tail. C.J. Wareing, T.J.O'Brien, Albert A. Zijlstra, K.B. Kwitter, J. Irwin, N. Wright, R. Greimel and J.E. Drew, 2006, "The shaping of planetary nebula Sh 2-188 through interaction with the interstellar medium", MNRAS, 366, 387. "Dying Sun-Like Stars Leave Whilrpools in their Wake", RAS Press Release PN 07/14 (NAM10), 17th April 2007. More images of Sharpless 2-188 on Dr C J Wareing's web site.